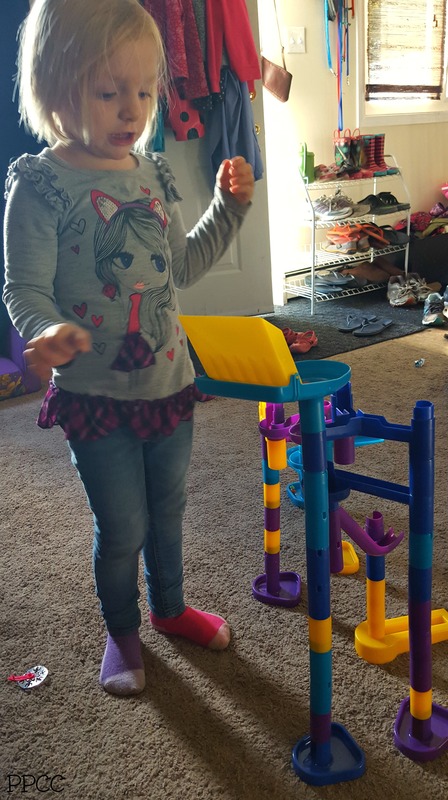 Toys That are Kid Approved and Kid Powered! Christmas is only a few months away and the hunt for toys that will engage and hold your child’s interest is on. You want toys that are kid powered and not just a single use product. Something that will challenge them and maybe even grow with them for a while. I had heard of Discovery Toys before but had not had an opportunity to see first hand what they had to offer. 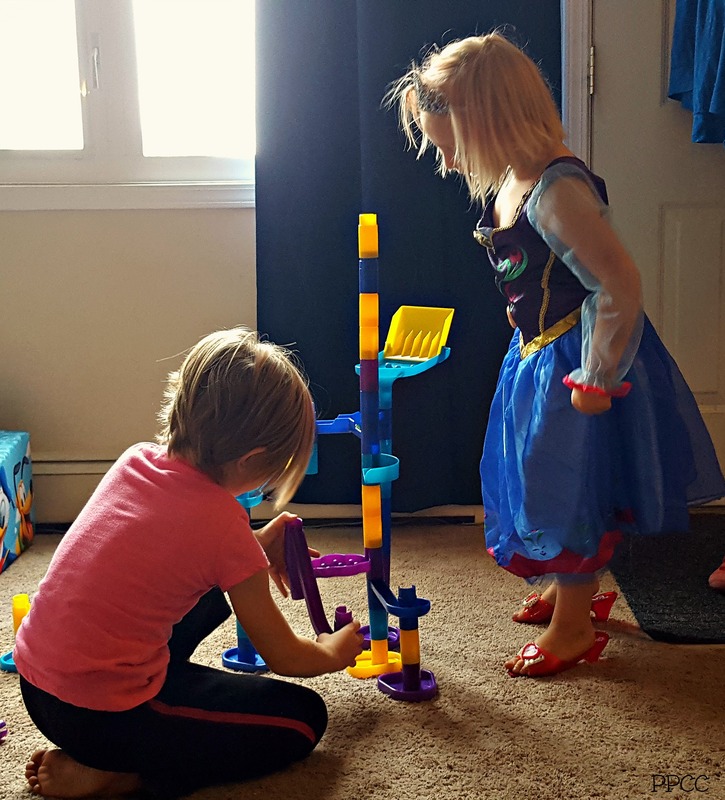 Discovery Toys Educational Consultant Rebecca Moge and I have teamed up, with my kids and myself reviewing popular items, and helping you pick out durable toys this holiday season (lifetime warranty against defects). 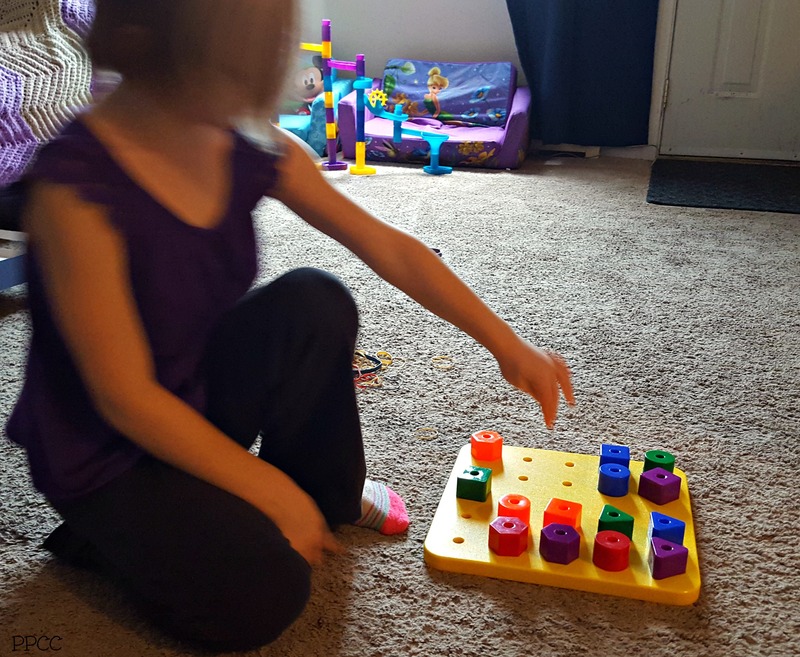 We tried out the Marbleworks set and Giant Pegboard and the kids were instantly drawn to them! 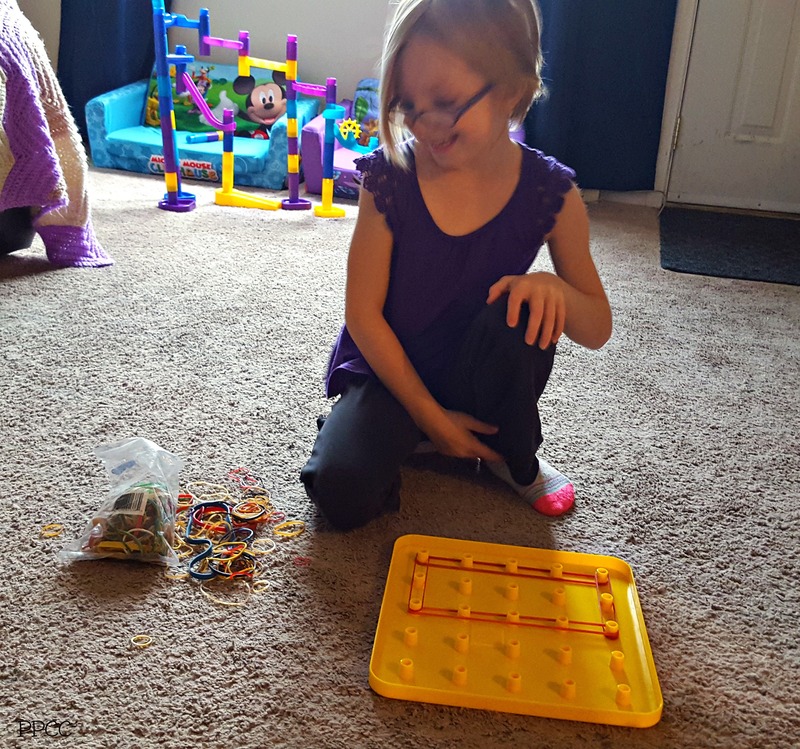 My not quite 3.5 yr old set out on constructing her Marbleworks raceway, I helped her connect the bigger pieces together (it’s recommended for 5+ but just supervise the marble use and younger ones can enjoy the fun too). She let the marbles go and cheered them as they rolled down! Big sis woke up not long after and they started having races and trying their marbles out from different starting positions. Over the last three weeks, it had daily use, occasionally had the track changed up, and kept the excitement going with friendly races and more cheers when they flew off the ramp. 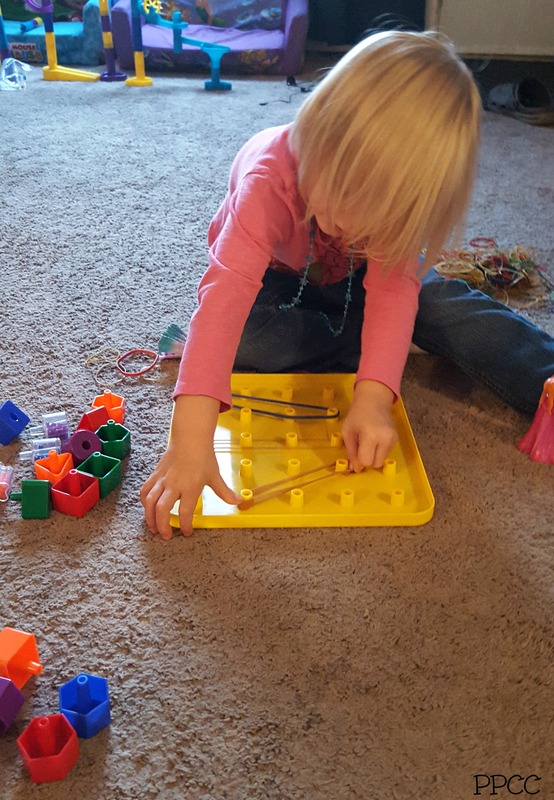 Chloe got the first chance to play with the Giant Pegboard, and although it says from 19 months +, my almost 7 year old enjoyed making patterns and shapes with the blocks and had fun stretching out elastics with the pegboard. Elastics are not include but you can usually pick up and bag of colored elastics at a dollar store. Kai enjoyed playing with the 2 sided board as well, having fun with the shaker blocks especially. It comes with a deck of activity cards, so they can try out new patters and designs. These two products are award winners and best sellers for a reason. They engage the children and I occasionally dropped a few marbles down as I passed by too. So get in contact with Rebecca today and make the holiday shopping easy. Check out the monthly specials or find out how you can earn free toys and discounts by becoming a party host or team member. There is also a contest running on her Facebook page for a chance to win a free product. All opinions above are truthful and my own. Yes, my children are really having fun in those pictures! For my full disclosure, please see here. I’m thrilled that the girls loved them so much. They truly are a great addition to a child’s life and a homeschooling family. 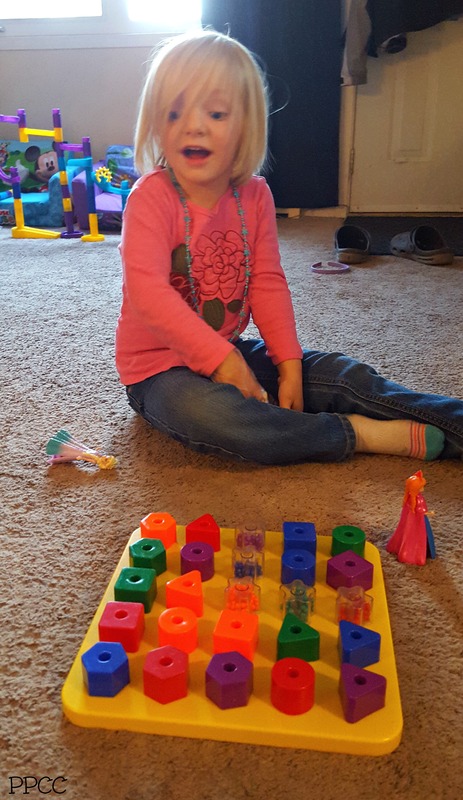 Thanks for allowing me into your life and sharing the goodness of Discovery Toys with you and your family.